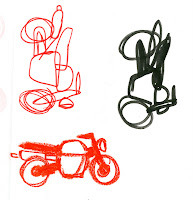 the map idea i originally had was quite strong on the idea of resistance, if you were a biker, working the shape of a car into the map only started to complicate things though. I still wanted to show that motorbikes had the ability to travel anywhere, or at least navigate easier than a car can do, but somewhere along the way I had lost sight of the theme again... I keep getting new ideas and wanting to progress them further as if I'm bored of the resistance theme now. "Gorilla is a visual column that comments on current affairs through words and images. Gorilla is published every week in De Groene Amsterdammer and Adformatie, and on thedailygorilla.com". now i thought it may have just been the one politically aimed piece of work that I discovered but as the above says and after browsing their website I found many pieces on themes like the Euro, Europe, Iraq, Oil, USA, Africa, Drugs, Religion and Advertising, to name but a few... Their work would probably look at home in newspapers and magazine articles as well as posters for events and even bear resemblance to book covers in their use of simplistic shapes and colours to give as much information as needed without over stimulating the audience. But as I mentioned, it was their "USA's exit strategy from Iraq" poster that caught my attention simply due to the maze design they used, it looked exactly like a map but was reduced down to its most simplistic, graphical and universal state. At first you understand the gag, saying that the USA doesnt have a plan and it's like they are wandering blindly through a maze until they finally leave but on 2nd viewing you notice the maze itself contains the word 'IRAK' within its design (dutch for Iraq, in case you didnt realise like me!) and if you follow the maze through, you discover there is no solution to the maze, there is no exit which is both humourous but also commenting on the US's actions at the time (the poster was made and printed in October 2006). But ignoring the theme for a moment, and looking at it in the context of being a poster or full page spread, the idea is that it should first be attention grabbing and then present information to the viewer. I've been given advice on how I should design a piece of work that rewards the viewer for looking deeper into it.. but I'm struggling a little bit working this into my current design. 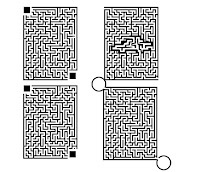 Top left: has multiple routes in order to complete the maze, Top Right: was a lame attempt at fitting a car into the middle of the maze, Bottom Left: has 3 seperate routes (easy, medium and hard) and finally, Bottom Right: has one complex winding route. 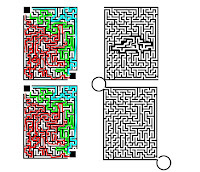 heres another showing the solutions to the bottom left maze etc. I might update this later with a few more initial sketches etc..